Confession: I can't stop checking my e-mail. I find myself reaching for my smartphone when I am in meetings, in the car, at the gym, at the beach. This impulse is surprisingly common. Studies suggest that the average worker checks his or her e-mail 36 times every hour and that as much as 40 percent of the U.S. population may suffer from some kind of Internet-based addiction. Modern technologies come with perks—such as the ability to connect with others and search for information on the go—but they can clearly intrude on our lives, too. In Irresistible, Alter, a marketing professor at New York University, explores the rise of tech-based addictions—how unhealthy relationships with our devices get started, how we become hooked and how we can detach. The path to dependence and the consequences, he notes, mirror what happens with drug addicts. Both kinds of addictions “activate the same brain regions, and they're fueled by some of the same basic human needs: social engagement and social support, mental stimulation, and a sense of effectiveness,” he writes. Pinpointing exactly when normal tech reliance morphs into a psychological problem remains a challenge, in large part because technology is now all-pervasive in our daily lives in ways that drugs and alcohol are not. We can, and often do, carry smart devices and laptops wherever we go; we shop, date, house hunt and work at our screens. “Millions of recovering alcoholics manage to avoid bars altogether, but recovering Internet addicts are forced to use e-mail,” Alter explains. Yet the problem goes beyond access. Alter reveals how companies deliberately design devices and apps to capitalize on our most basic psychological needs for approval and success. So-called ludic loops—habit-forming circuits that influence dopamine levels in the brain—may explain, on a biological level at least, why we become obsessed, he says. These ludic loops drive Instagram users to chase the next stream of “likes” and Internet gamers to play for hours. They are strengthened every time we experience the high of posting a well-liked image or reaching a new level of Candy Crush. So how can we unplug? Alter travels to a gaming and Internet addiction treatment center in Washington State to learn about various recovery strategies. For most users, simply taking a few moments of screen-free downtime every day can lessen tech's lure. That fact is prompting some experts and organizations to work toward developing novel ways to minimize people's exposure. German car manufacturer Daimler, for example, allows employees to change the settings on their work e-mail accounts so that they automatically delete incoming messages during vacations. Similarly, one Web developer has created a browser add-on that makes it impossible to check how many likes or comments a Facebook post generates. In an essay in 1945, behavioral psychologist B. F. Skinner argued that our emotions are little more than social constructs: we think they exist only because the people around us tell us how to label our internal experiences. But in 1962 social psychologists Stanley Schachter and Jerome E. Singer showed just how tenuous this labeling scheme is. They jolted people's nervous systems with shots of adrenaline and found that how they described the effects depended on how the people around them behaved. In the presence of a euphoric person, the participants felt euphoria; when close to an angry person, anger. Now Barrett, a psychology professor at Northeastern University, takes such thinking to a new level and, some might say, a new extreme. Drawing on extensive research that she and her students have been conducting for more than a decade, she argues that we create our own emotions based on how we learn to interpret both bodily sensations and our current circumstances. In other words, we do not experience the world directly but instead build mental models that help us predict and define what is happening to us. These states of mind are not very different from thoughts, which is why Barrett also rejects the common belief that emotions cause thoughts or behaviors (as in “she shouted and stamped her feet because she was angry”). How Emotions Are Made defends the author's “constructionist” view of emotion—and specifically the idea that, with little or no awareness, we generate our emotions on the fly. Barrett also rejects the more intuitive and traditional “essentialist” view that emotions such as anger and sadness have distinct essences, universal across cultures. She is especially dismissive of the pioneering work by psychologist Paul Ekman, whose painstaking cataloguing of emotion-correlated facial expressions has been supported by a huge number of studies. Barrett cites a fundamental design flaw: Ekman-type studies, she says, always suggest fixed emotion categories, a concept that her own studies reject. The idea of time travel is highly seductive. Cult classic movies such as Back to the Future and Primer imagine a reality in which we can physically hop among the past, present and future. In contrast, Arrival presents time travel in a more cerebral form: this 2016 film features four-dimensional beings—aliens who can control their placement in time and even perceive their birth and death simultaneously. Such diverse portrayals exist, in large part, because time itself—what it is and how we understand it—remains enigmatic. In his new book, Buonomano, a neuroscientist at the University of California, Los Angeles, takes a stab at unraveling the complex nature of time. He begins by exploring the prevailing theories. According to physics, we live in what is called an eternalist universe, where time—like space—is a dimension and, as in Arrival, the past, present and future all exist simultaneously. One of the strongest pieces of evidence backing the eternalist theory comes from Einstein's theory of relativity, which revealed that space and time lie together on a continuum. Along this nonlinear timeline, we should be able to move physically between different periods. But this eternalism clashes with how humans actually experience time. Our reality fits better with the theory known as presentism—in which we can imagine the future and remember the past, but only the present is real. How to reconcile the two ideas? Buonomano speculates that our brain must have adapted to understand time as something that moves forward in a linear way. Perhaps, though, there is a middle ground. Studies suggest that space and time not only are threads along a single tapestry in the physical world, as Einstein showed, but may also be closely entwined in the brain. Researchers have found, for instance, that patients with spatial hemineglect—or an unawareness of objects on one side of the body—also have trouble remembering the timing of events. In addition, we often use spatial terms to describe time—“Boy, was that a long lecture” or “Let's move the meeting forward a week.” Some scientists theorize that, as we evolved, the neural circuits recruited for perceiving time were co-opted by those used to comprehend space. First, let me say that I felt some trepidation in approaching what is being touted as the “masterwork” of such a prolific philosopher, famous for pondering the complexities of consciousness and free will. But this work touches on themes that every curious person with an existential itch—or knowledge of psychology, psychiatry or neuroscience—has contemplated: What is the mind? How and why are humans “conscious” in a way that other animals are (probably) not? In answer to the first question, Dennett adheres to a materialist view: He believes that our mental capabilities are nothing more than a by-product of the brain's physical processes. We simply evolved the how and why of human consciousness, which gave rise to thinking and the ability to think about thinking. Well, not simply. I wouldn't use “simple” to describe anything about this work. Dennett's central argument is that all of the intricate “design” that went into building our conscious minds happened through processes that were competent (they worked) but lacked comprehension (no one planned it that way). The evolution from bacteria (competent) to Bach (comprehending) happened faster than gene-based natural selection would allow and relied instead on cultural evolution via memes—any idea or trend that we share as a way to expand our cognitive tool kit. Although his theory about consciousness may be impossible to prove, Dennett convincingly builds his case that we developed consciousness from “a cascade of competences” using recent evidence, plus historical lessons from philosopher René Descartes, biologist Charles Darwin and computer scientist Alan Turing. 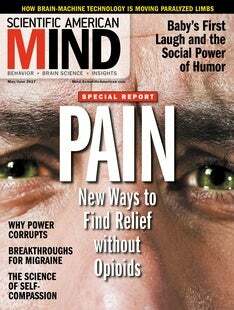 Robert Epstein, senior research psychologist at the American Institute for Behavioral Research and Technology in Vista, Calif., is a contributing editor for Scientific American Mind and former editor in chief of Psychology Today. His latest book is Teen 2.0: Saving Our Children and Families from the Torment of Adolescence (Linden Publishing, 2010).